The renowned cellist performs works by Bach, Haydn, Beethoven, Schumann, Chopin, Franck, Debussy, etc. Accompanied by pianists Mitchell Andrews, Arthur Balsam, Leonid Hambro, Frank Iogha, and Jack Maxin. Mono, 2-CD set. 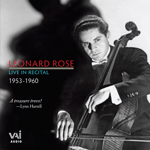 *The first release of this repertoire by Leonard Rose.